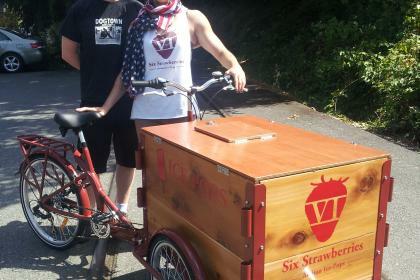 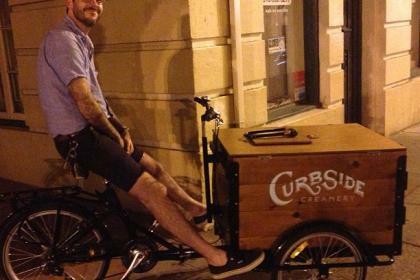 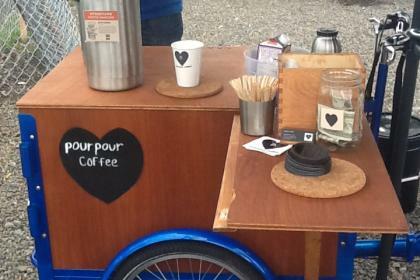 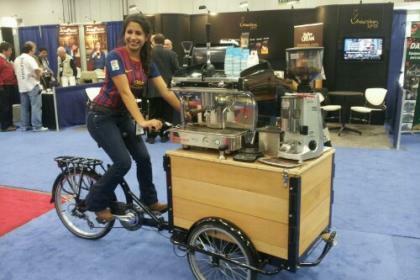 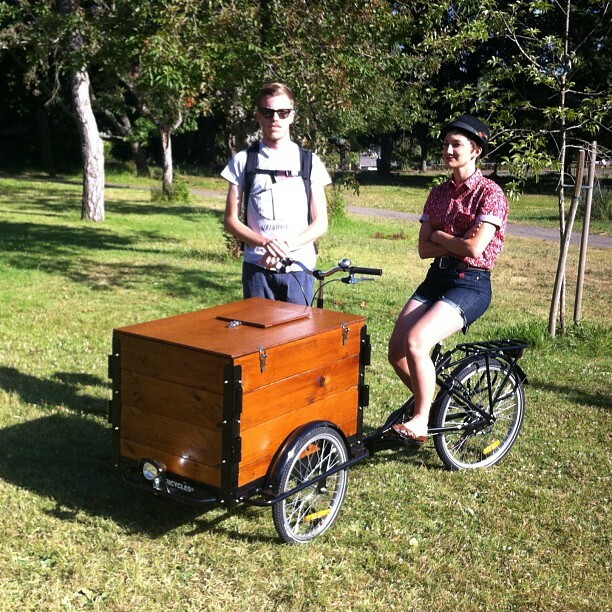 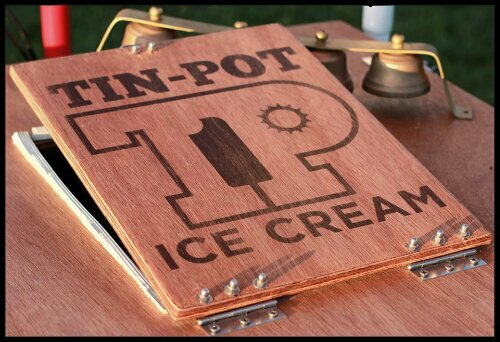 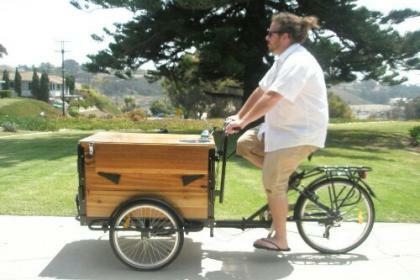 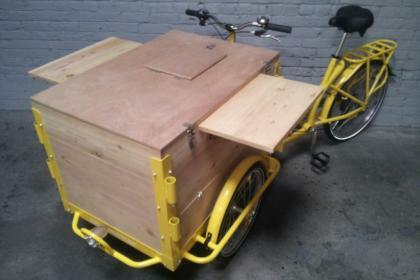 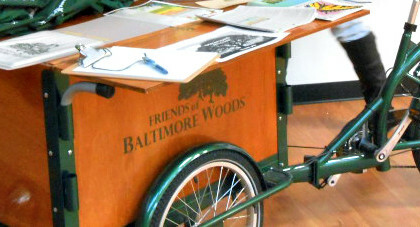 Hand-Built Wood Panel Vending Tricycles! 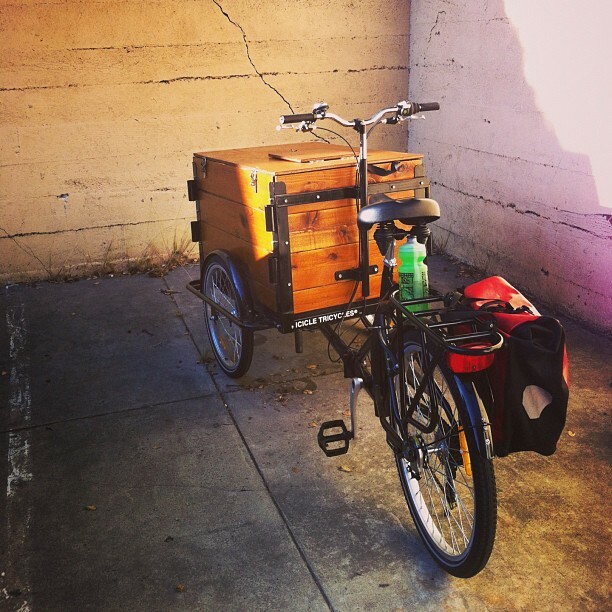 Enjoy the grain and style of wood? 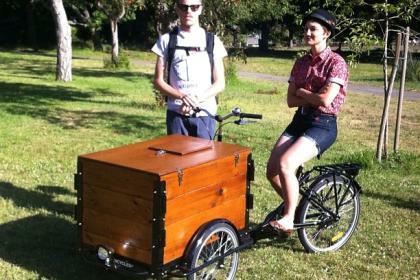 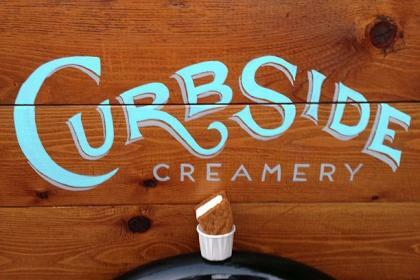 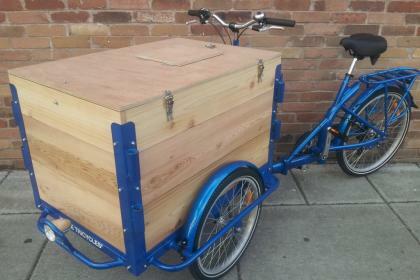 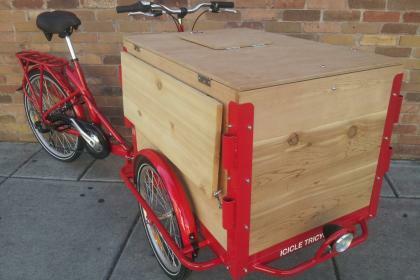 Purchase an Icicle Tricycles Wood Panel Vending Tricycle. 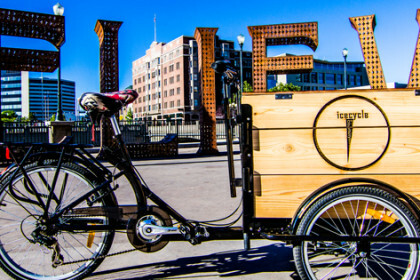 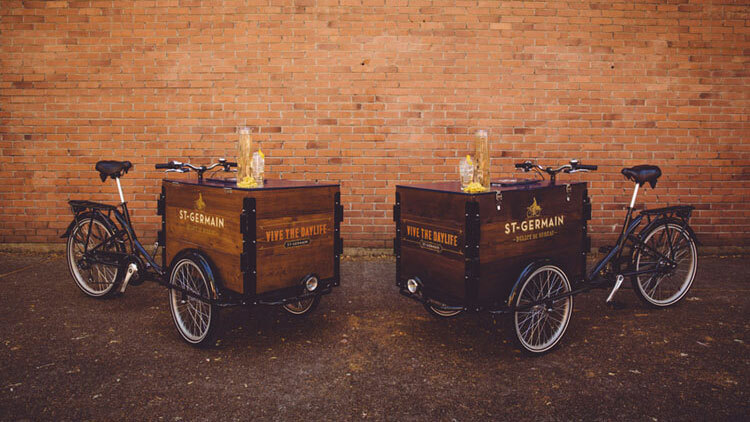 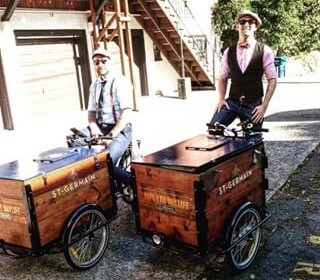 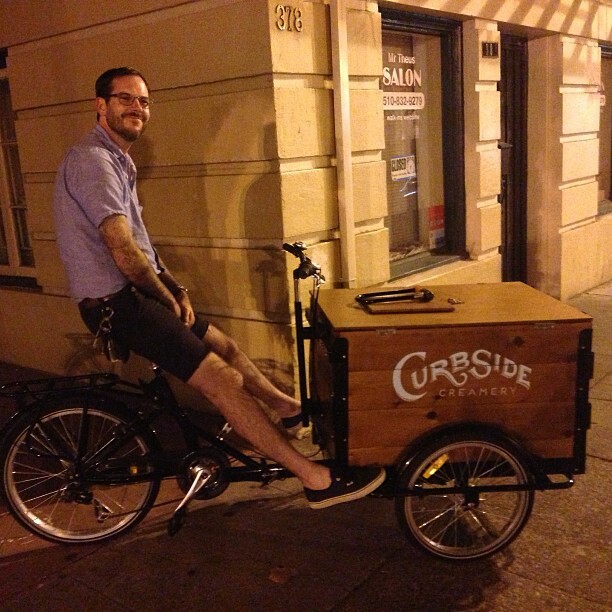 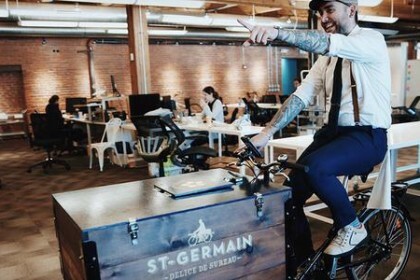 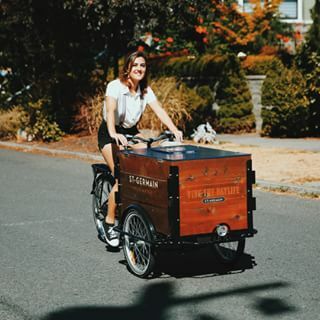 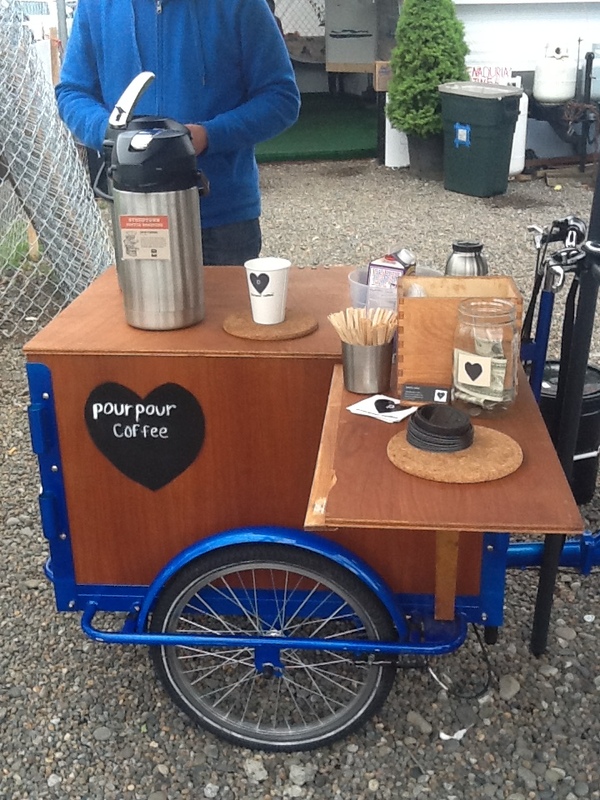 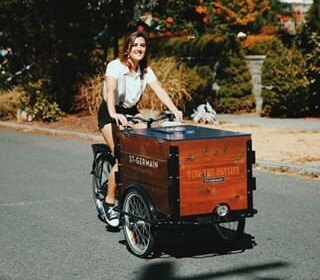 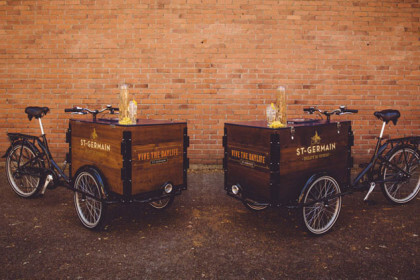 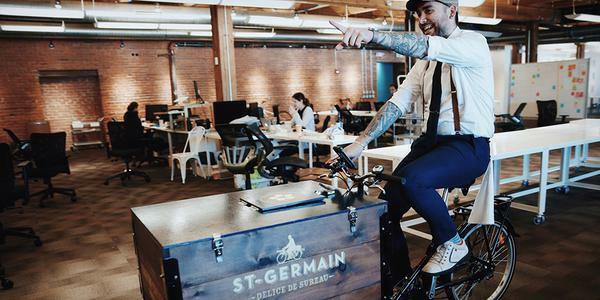 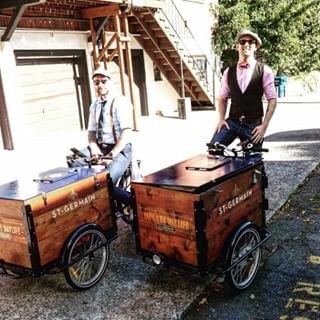 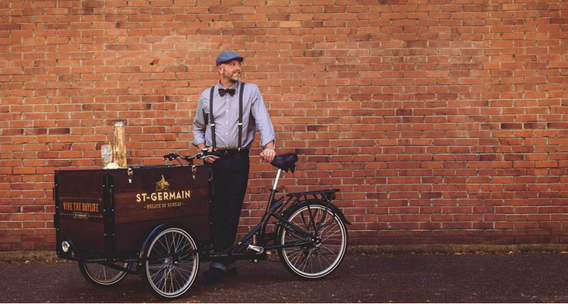 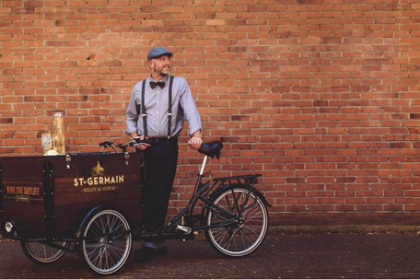 100% hand-built right here in Portland, our wood box vending tricycles are a stylish approach to peddling your business wares! 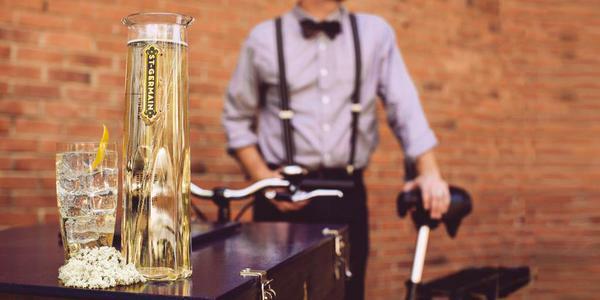 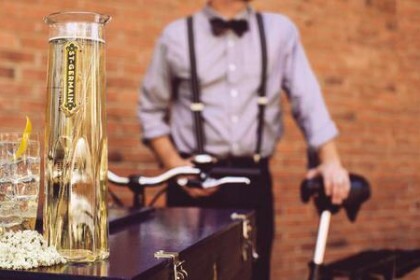 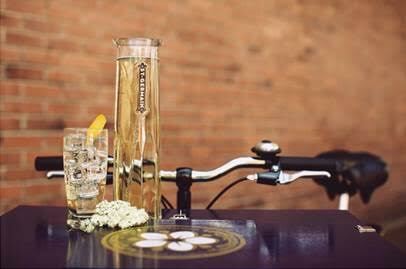 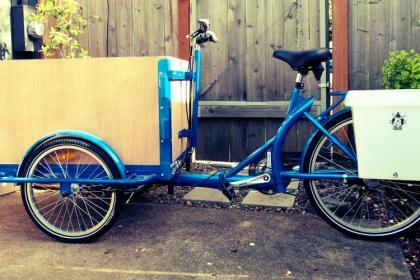 Just like owning a vintage tricycle, but brand new! 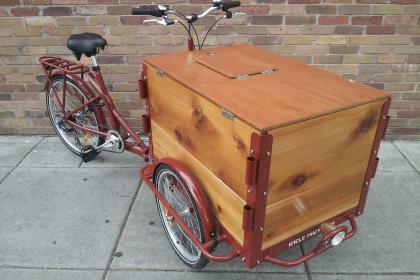 Sell your product with the stylish and timeless look of cedar wood. 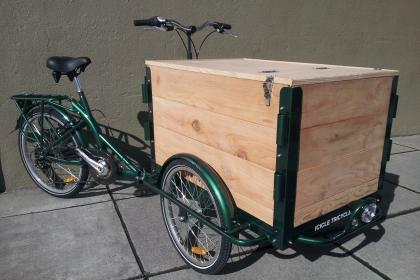 A high quality, sturdy, and surprisingly light and reliable wood often used for building houses and boats. 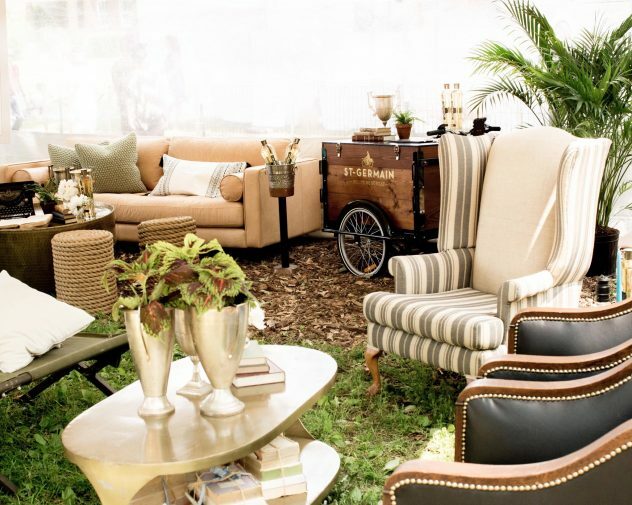 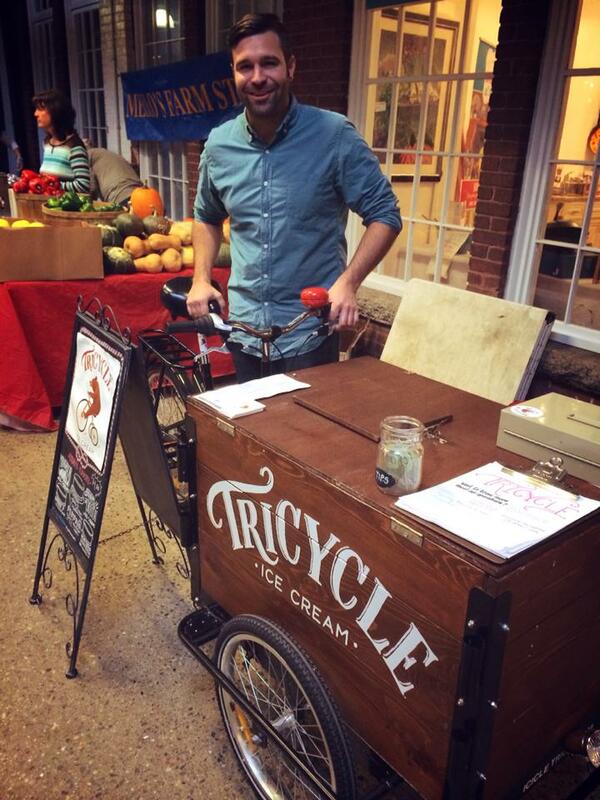 A vintage tricycle look built to last and to turn heads for a lifetime! 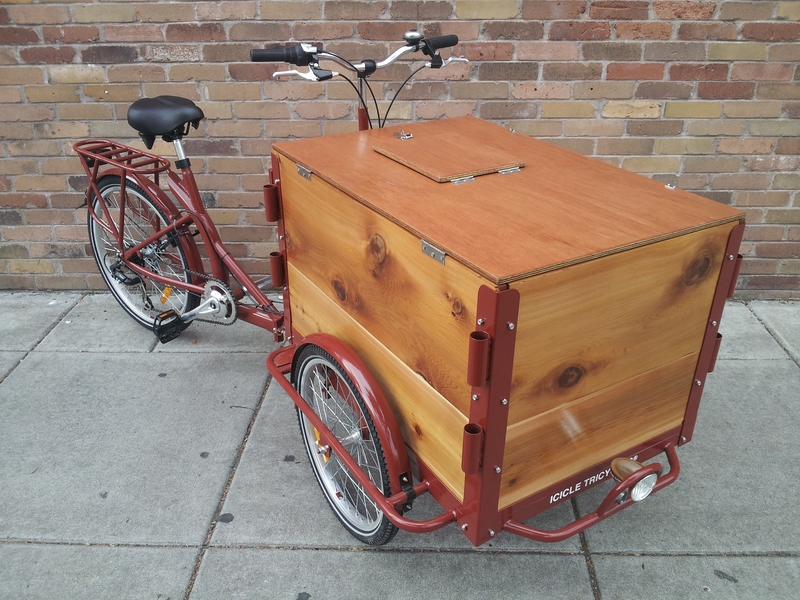 A fantastic way to convey a product or product color that pairs with the notions of wood. 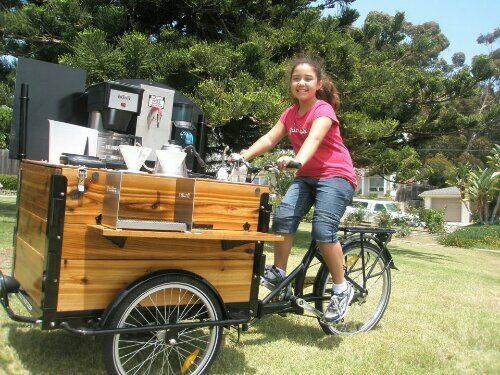 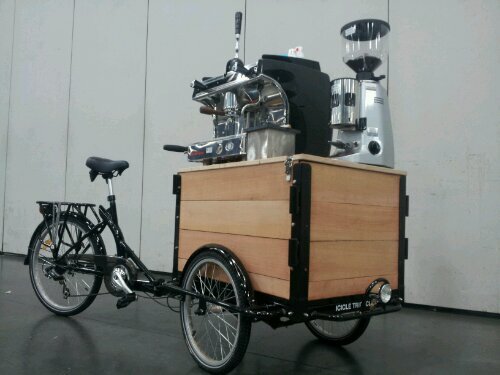 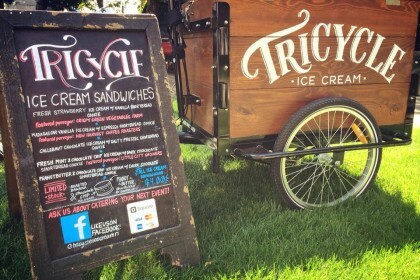 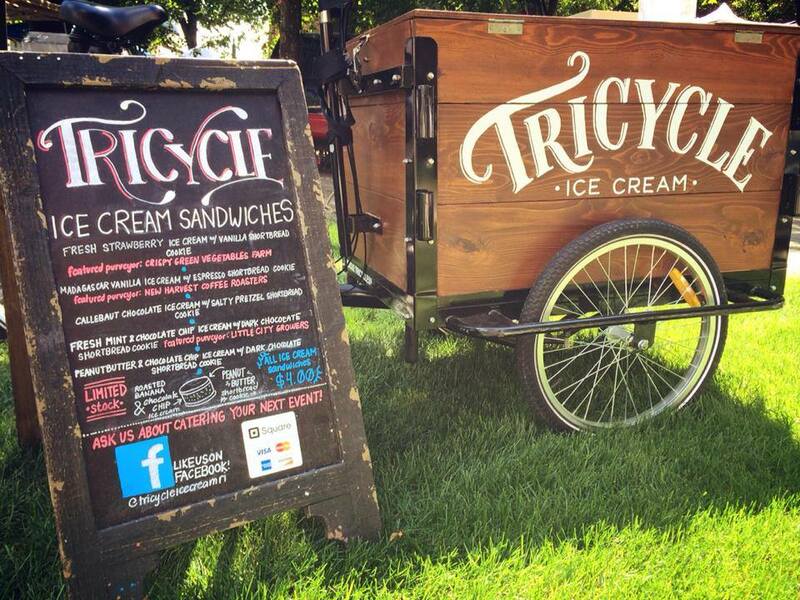 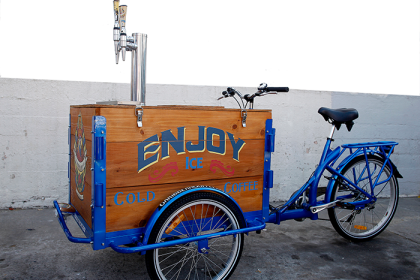 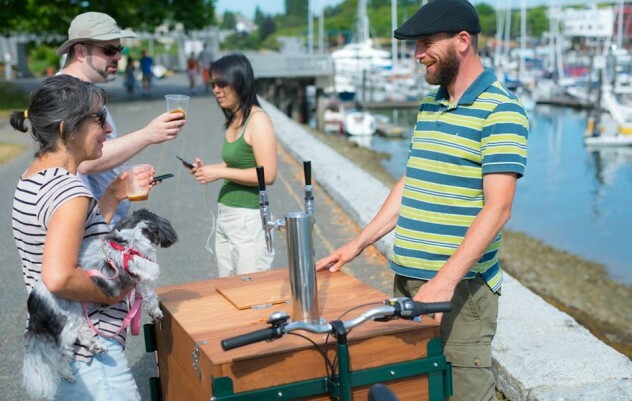 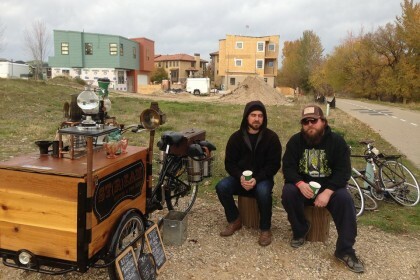 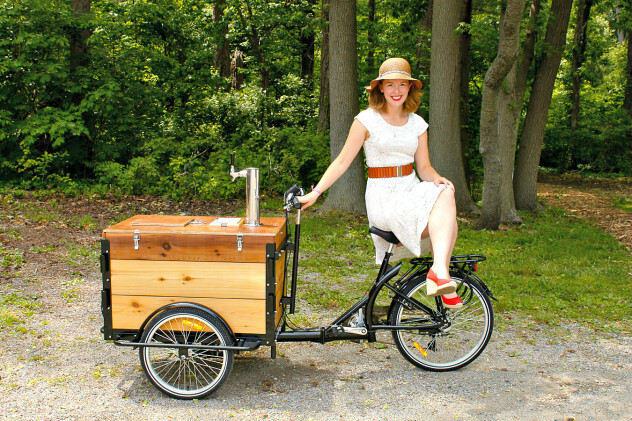 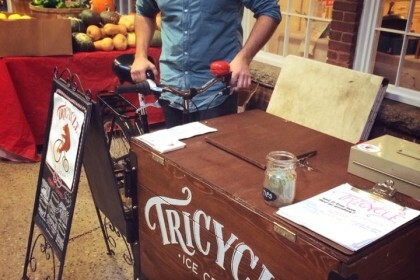 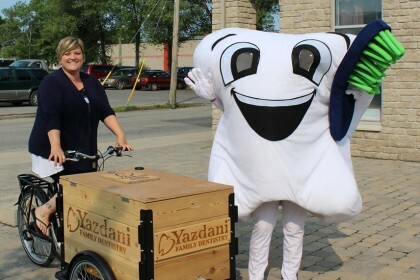 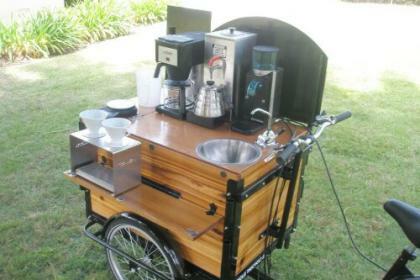 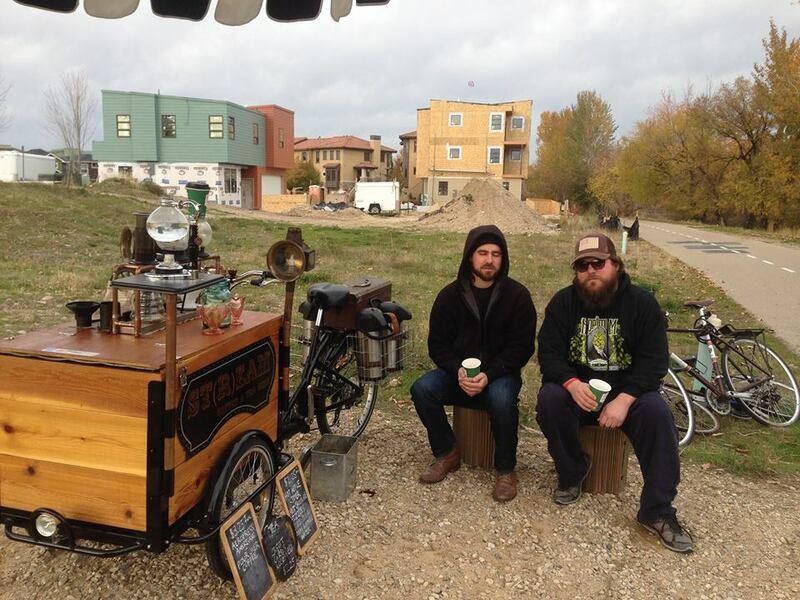 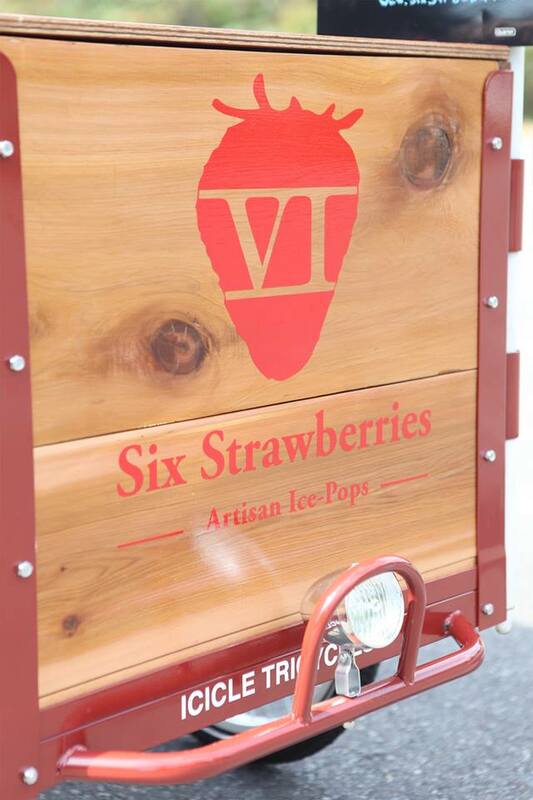 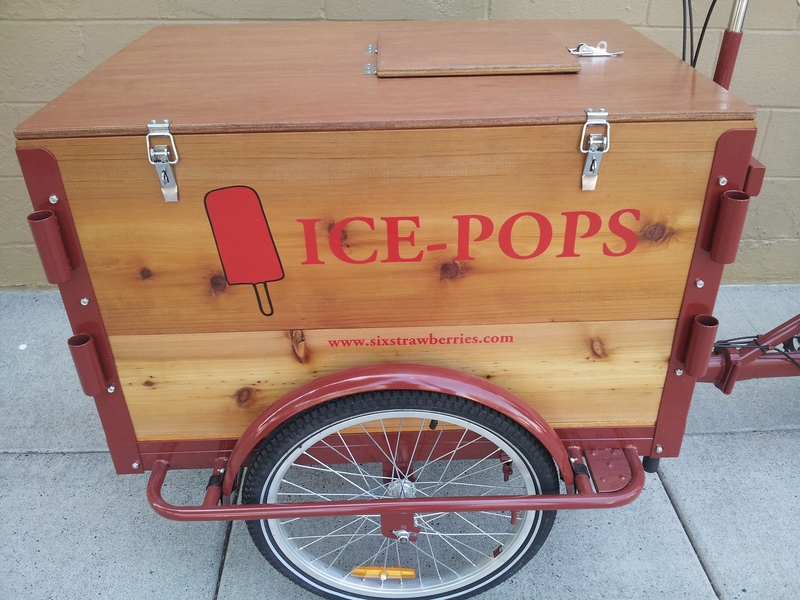 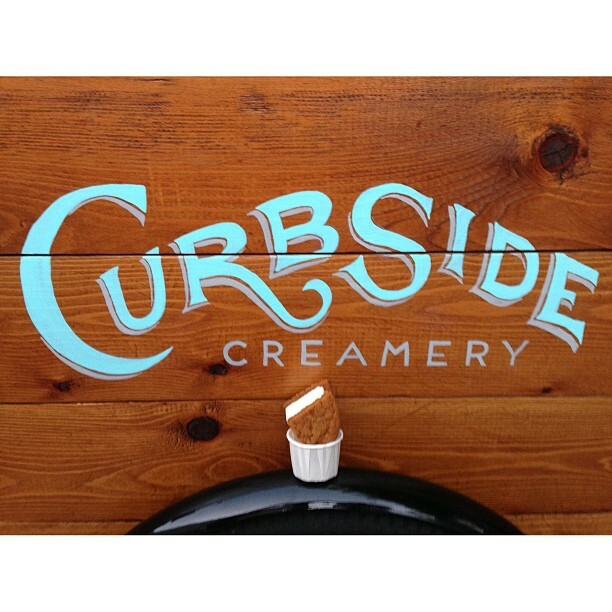 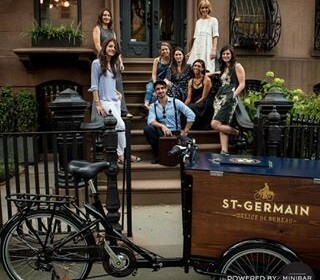 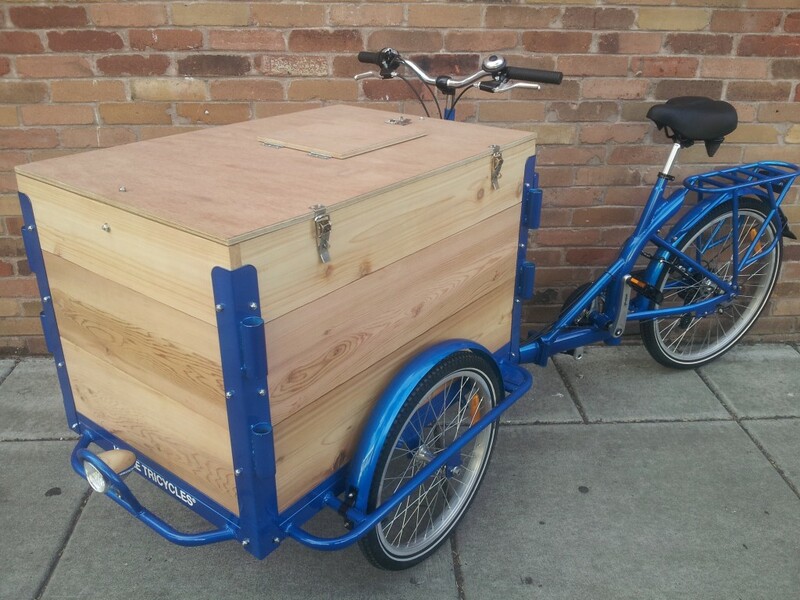 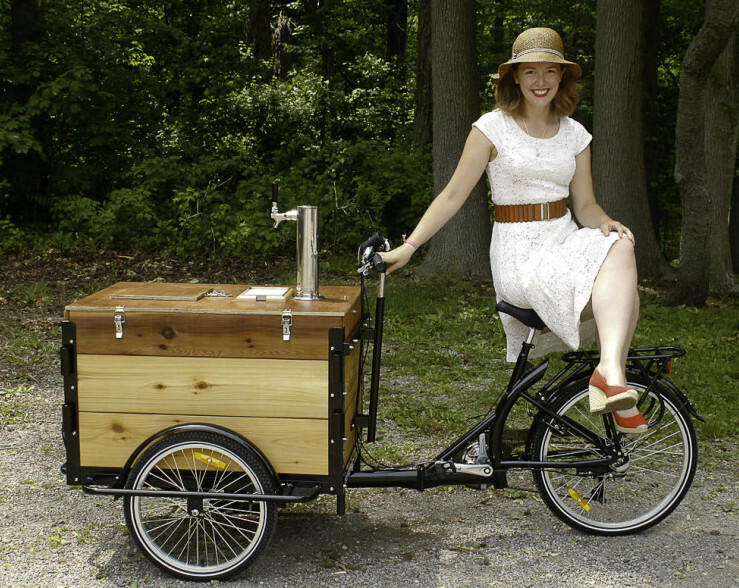 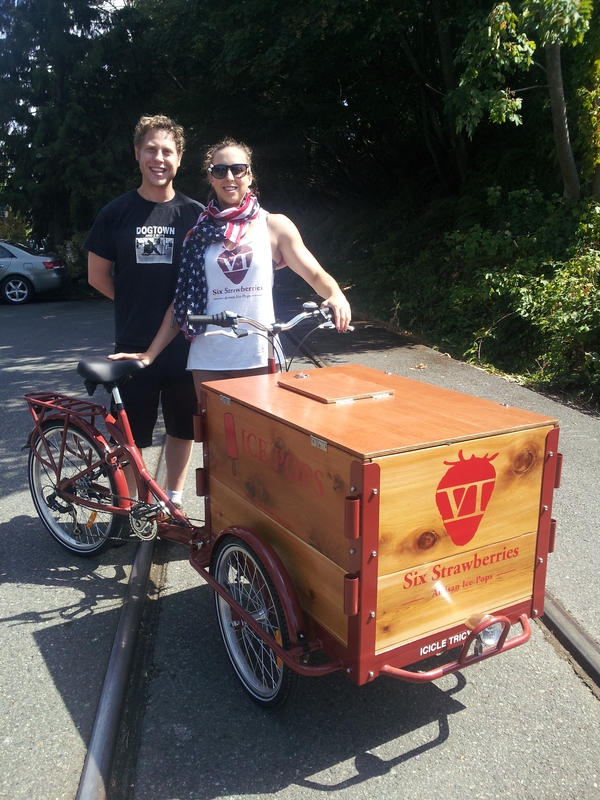 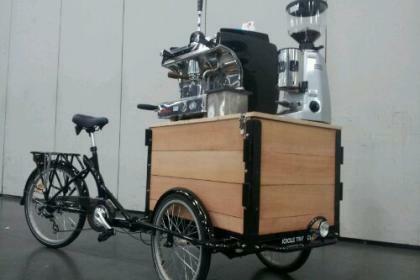 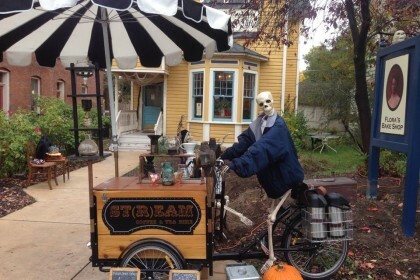 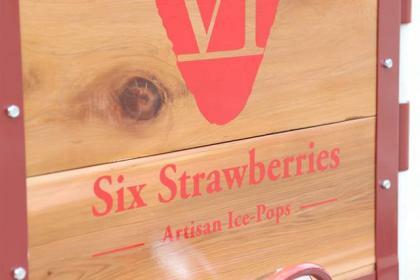 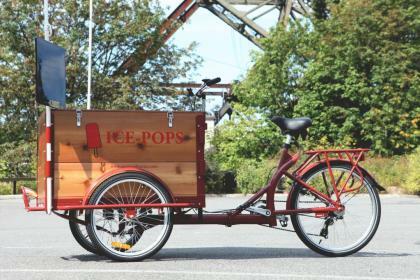 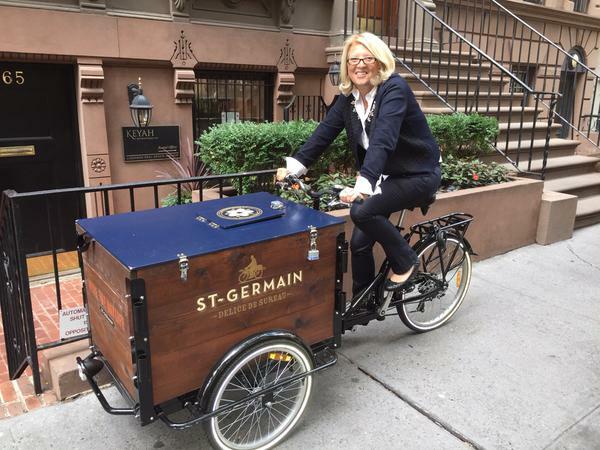 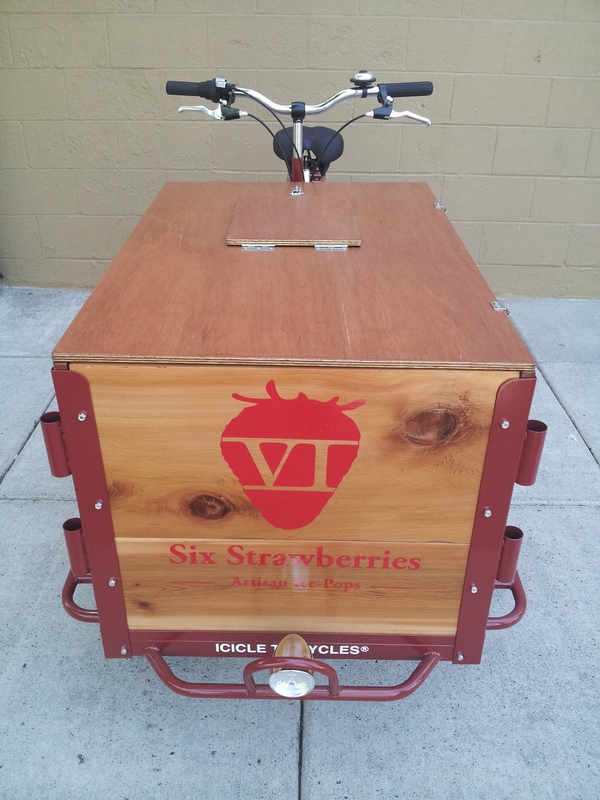 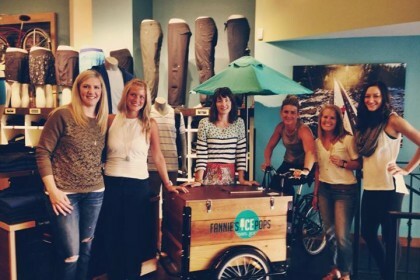 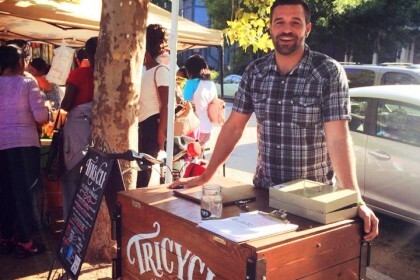 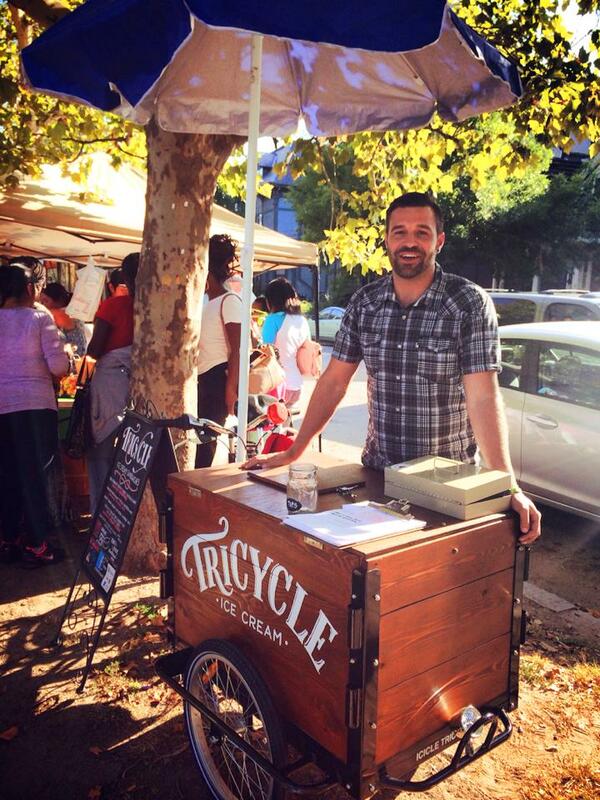 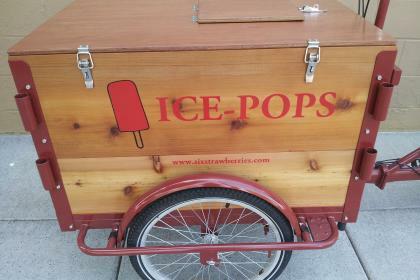 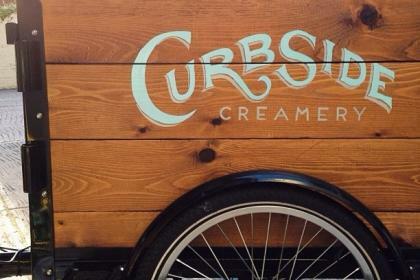 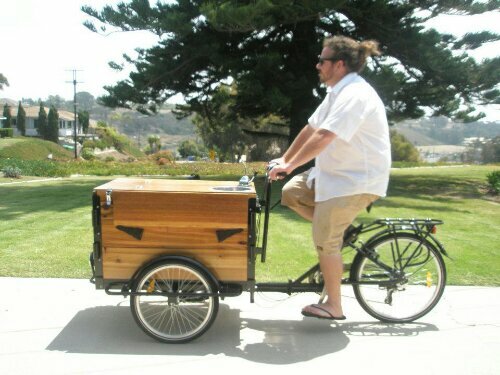 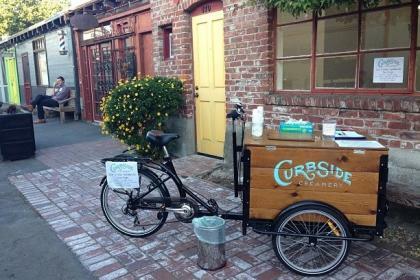 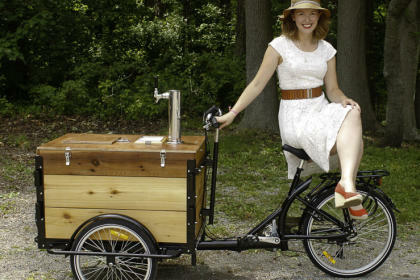 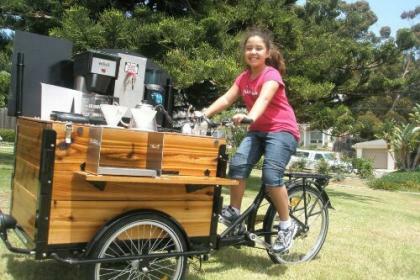 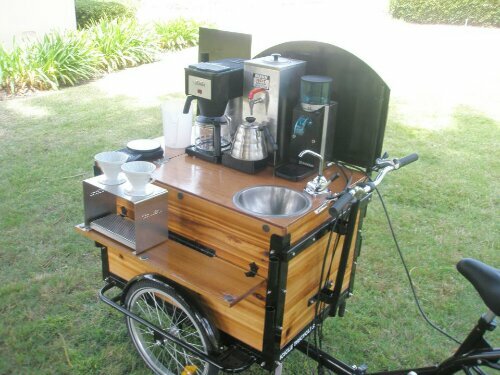 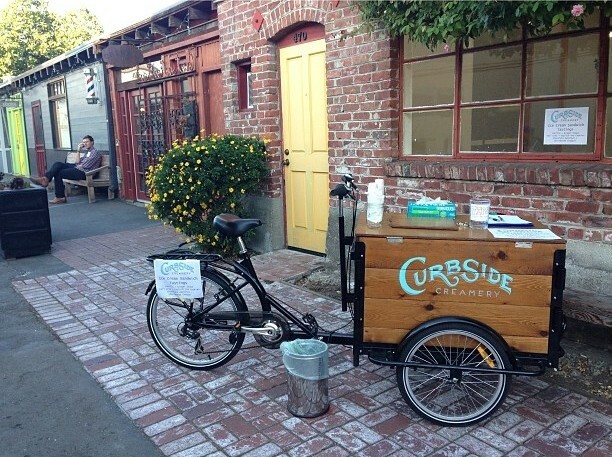 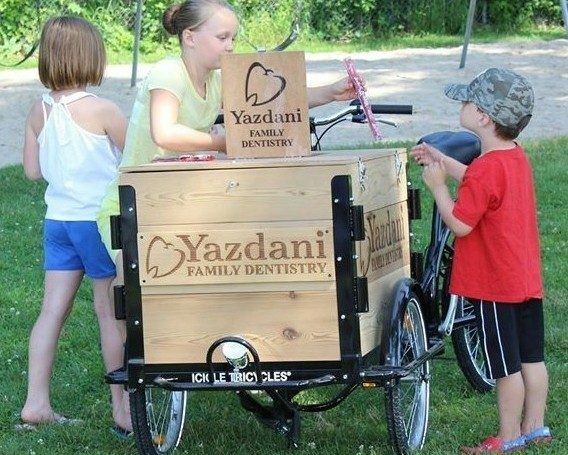 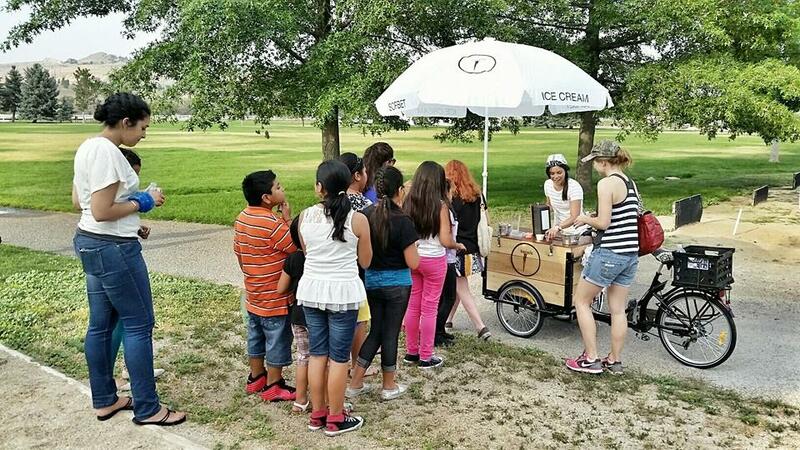 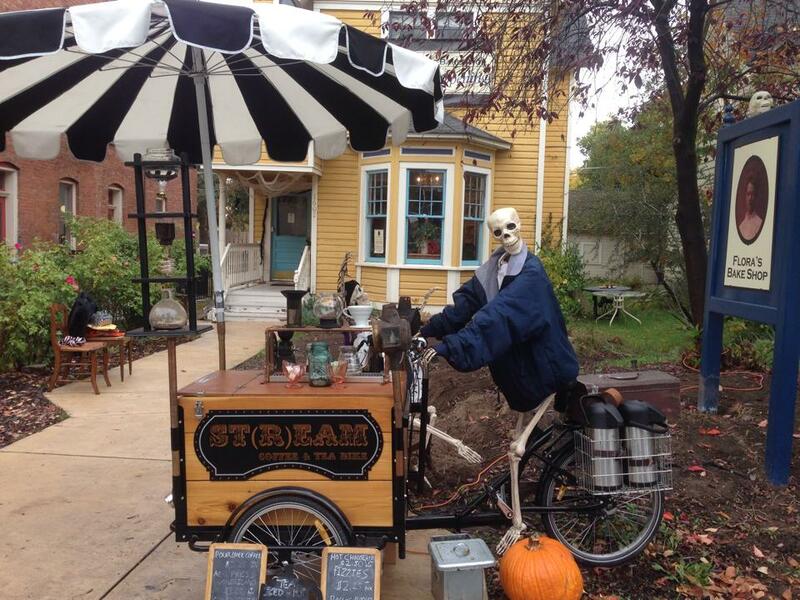 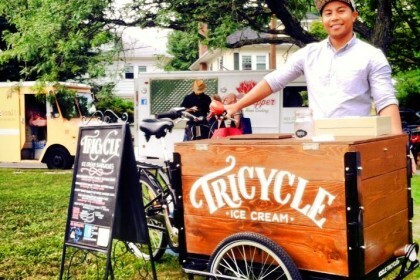 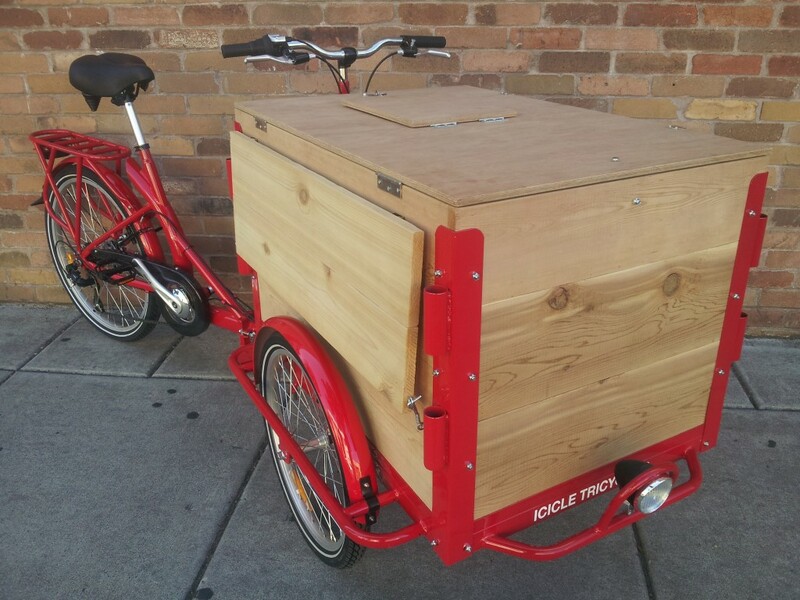 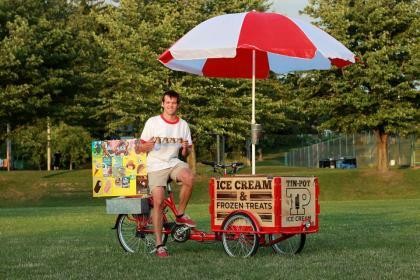 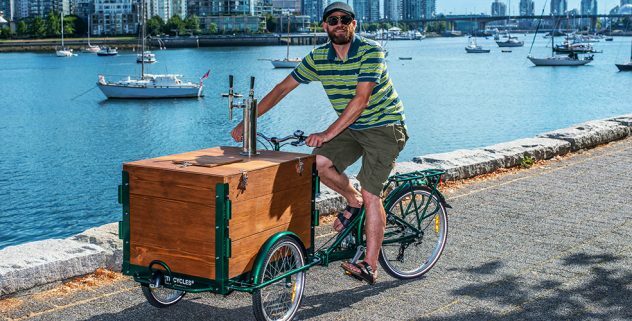 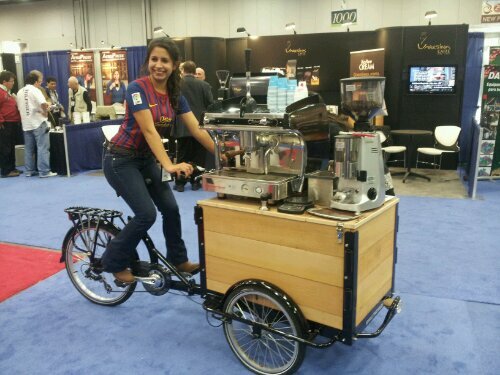 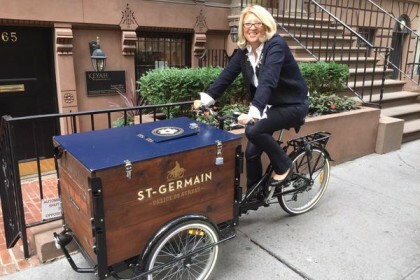 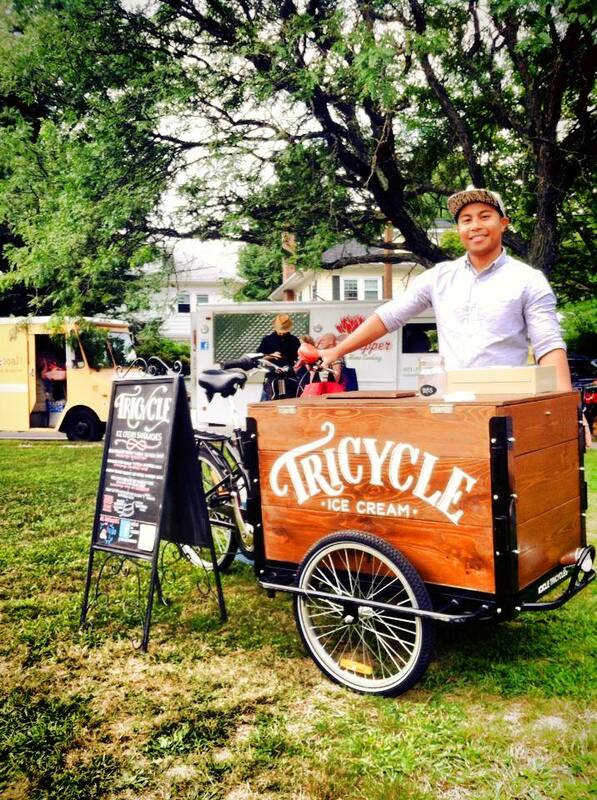 Raw, stained, or laser engraved, an Icicle Tricycles custom wood vending bike is the natural way to roll out your business plan! 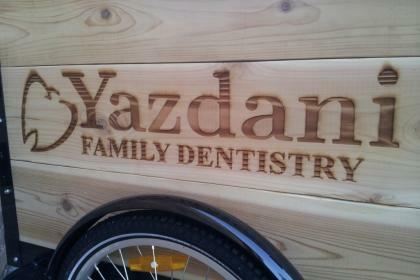 On top of our wood box options, we offer wood burning and laser engraving. 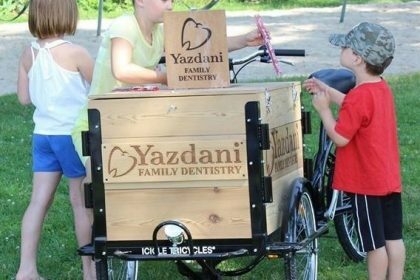 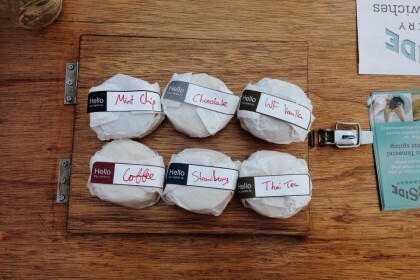 A unique and highly effective method to display your company name. 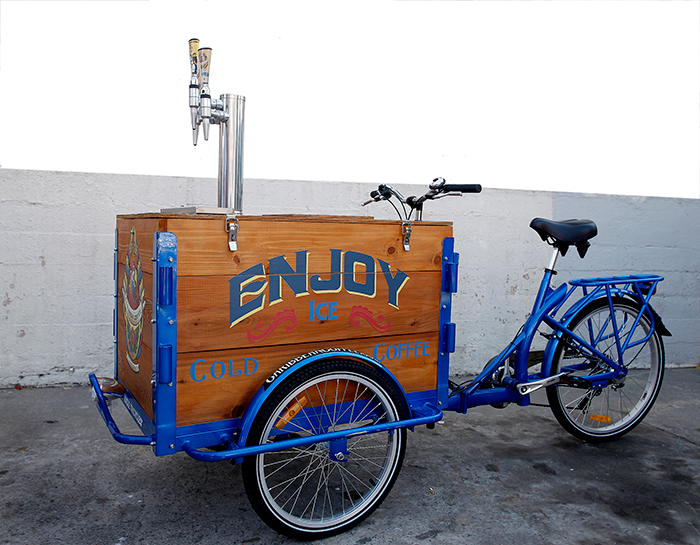 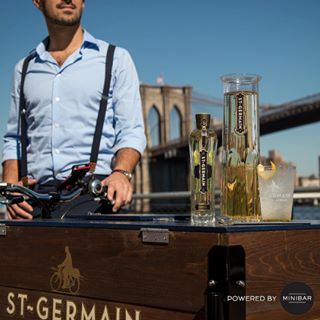 Get your brand logo a new look or exemplify a new product with that ‘old school’ vintage tricycle feel. 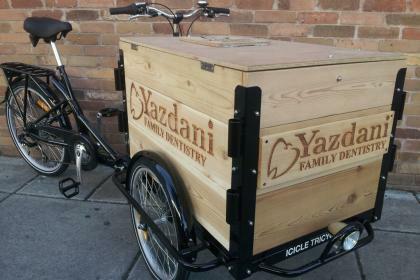 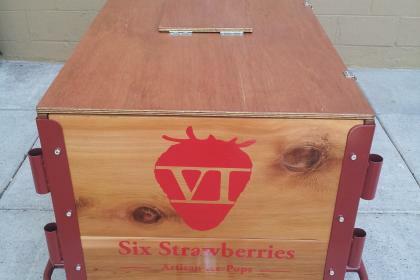 Your new raw or wood-stained laser engraved wood box vending tricycle will surely turn heads, as well as a profit! 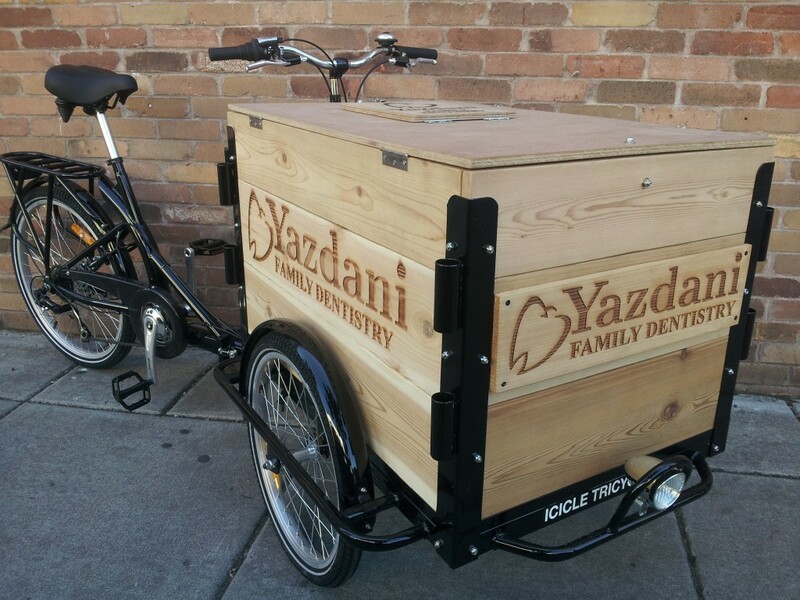 Built both a business machine and a commercial vehicle, our tricycles are built to serve your community wherever they might be. 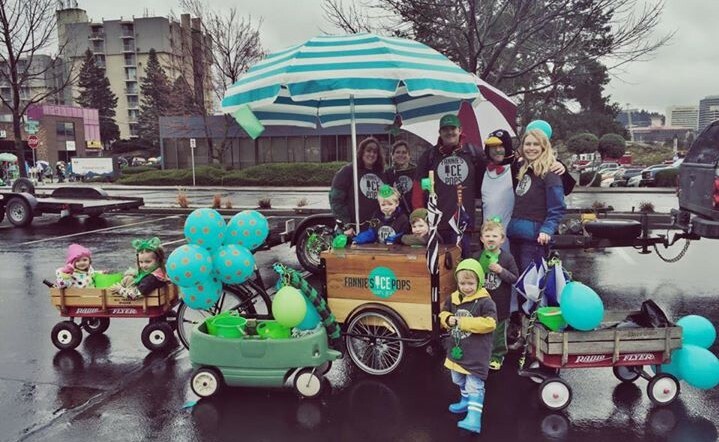 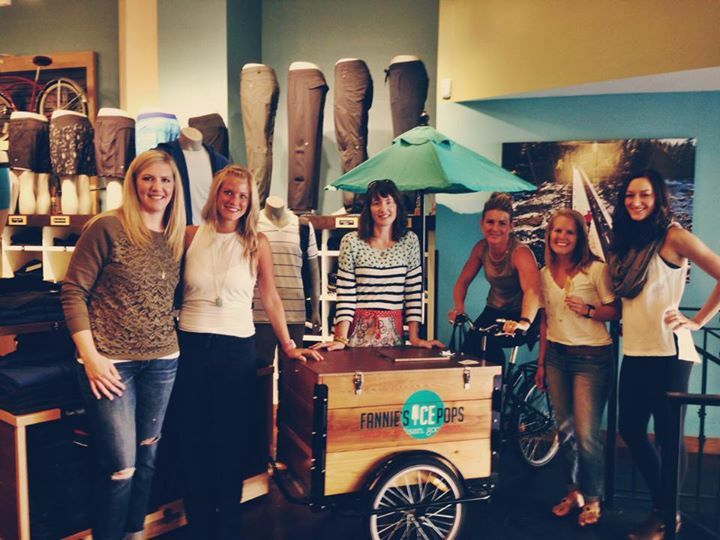 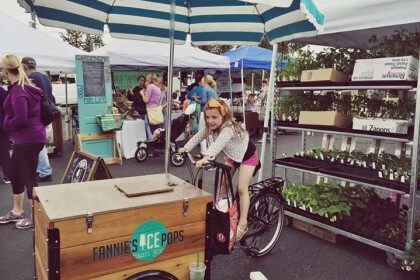 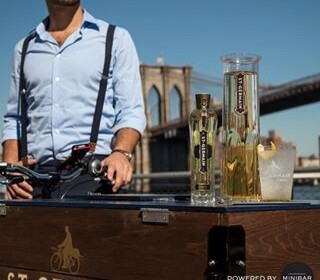 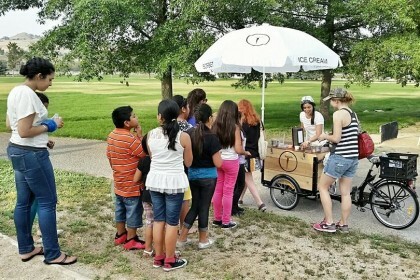 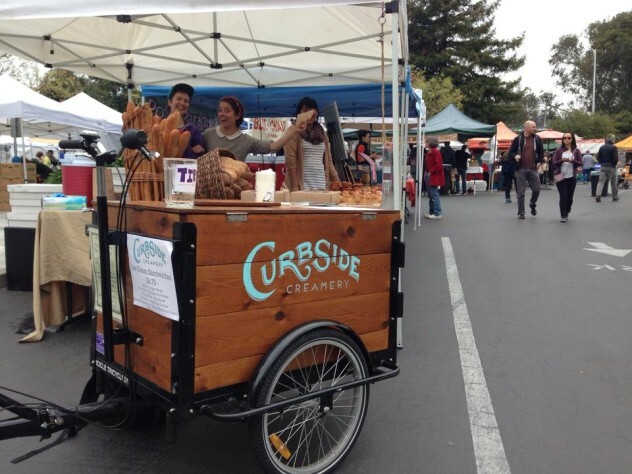 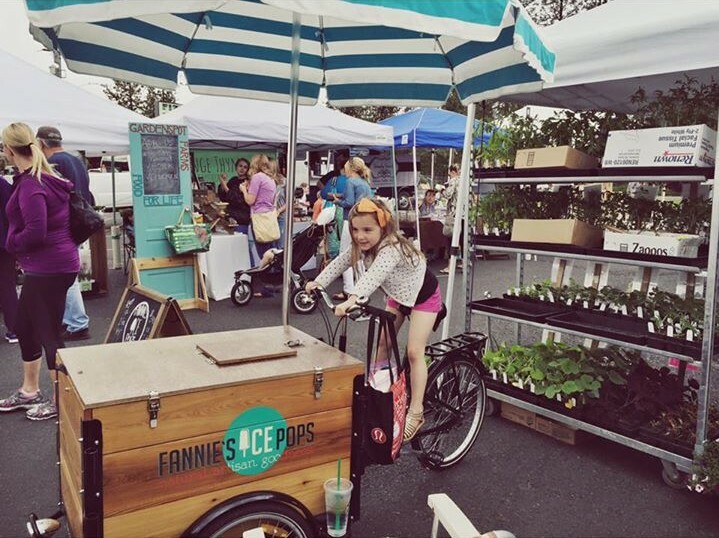 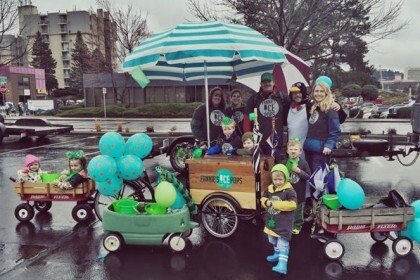 Roll out to farmers markets, sporting events, music venues, or anywhere you can park – Icicle Tricycles vending carts are conveniently sized to market your products anywhere you can fit them! 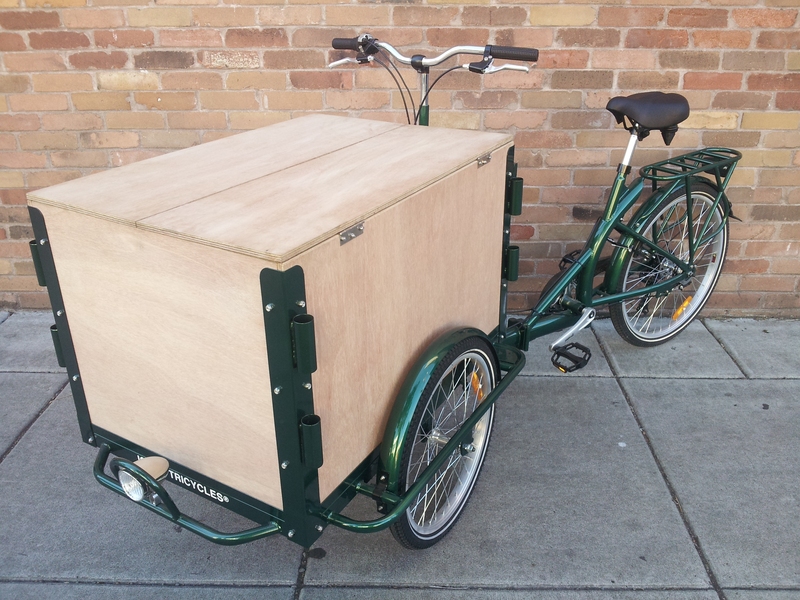 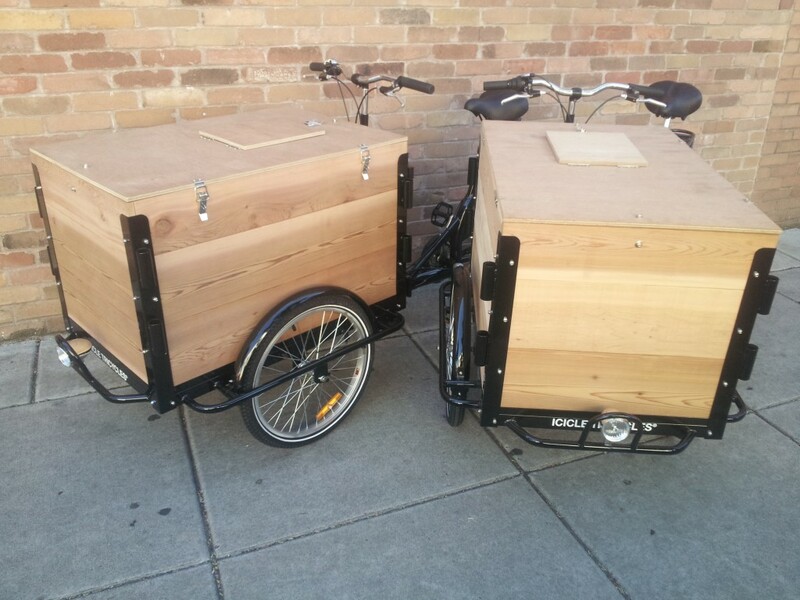 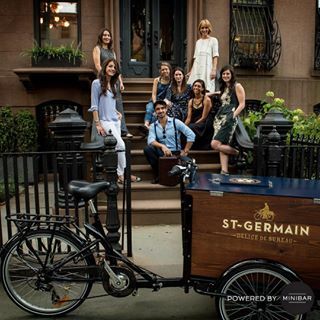 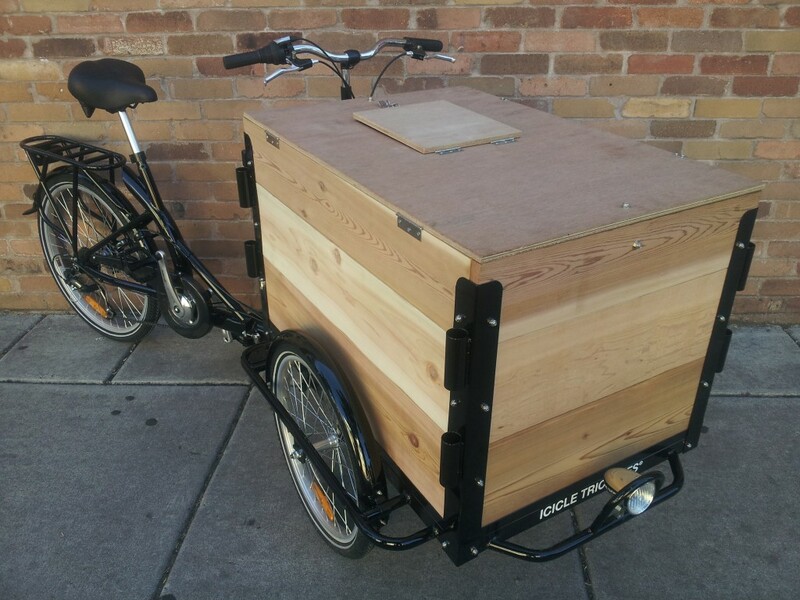 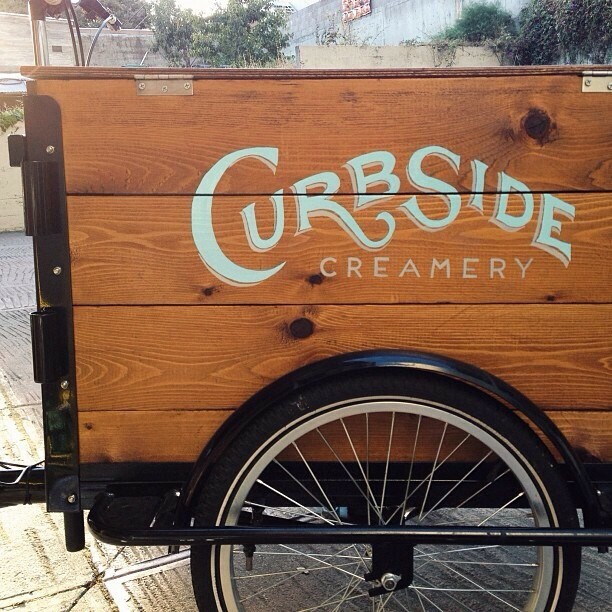 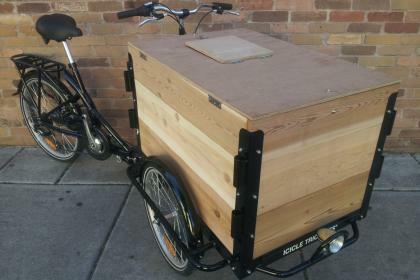 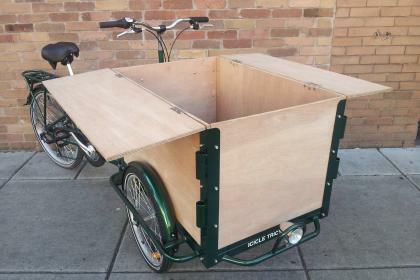 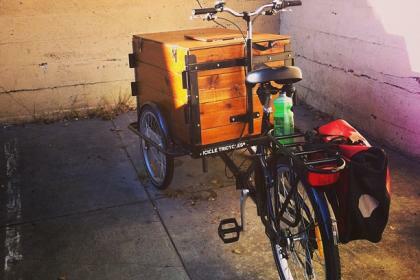 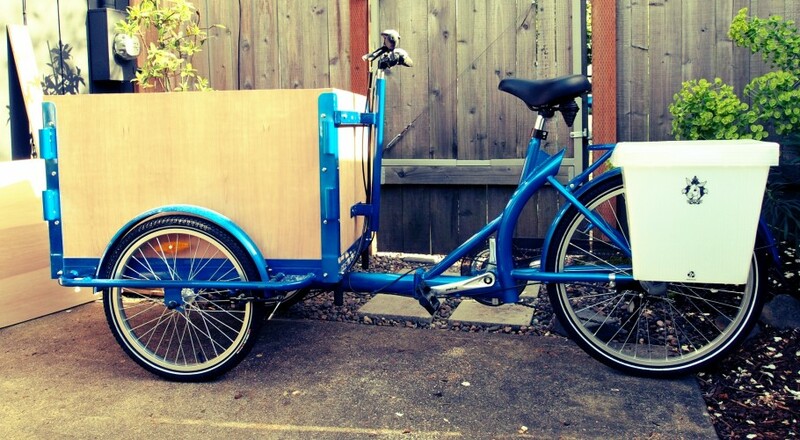 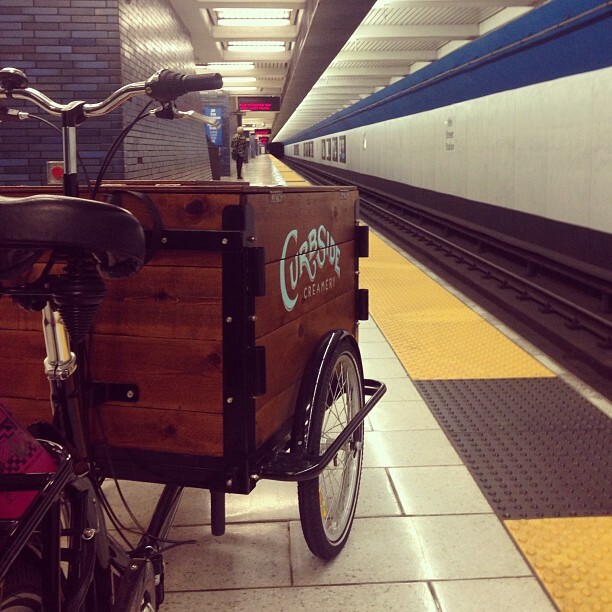 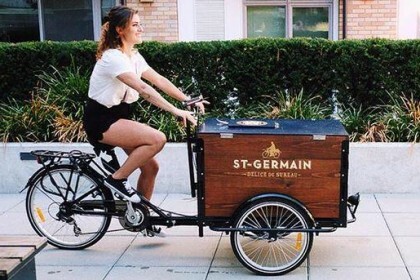 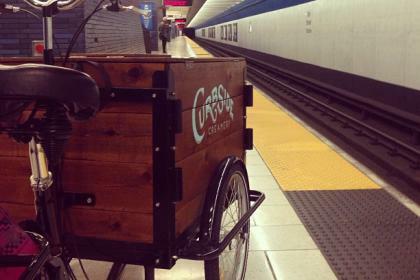 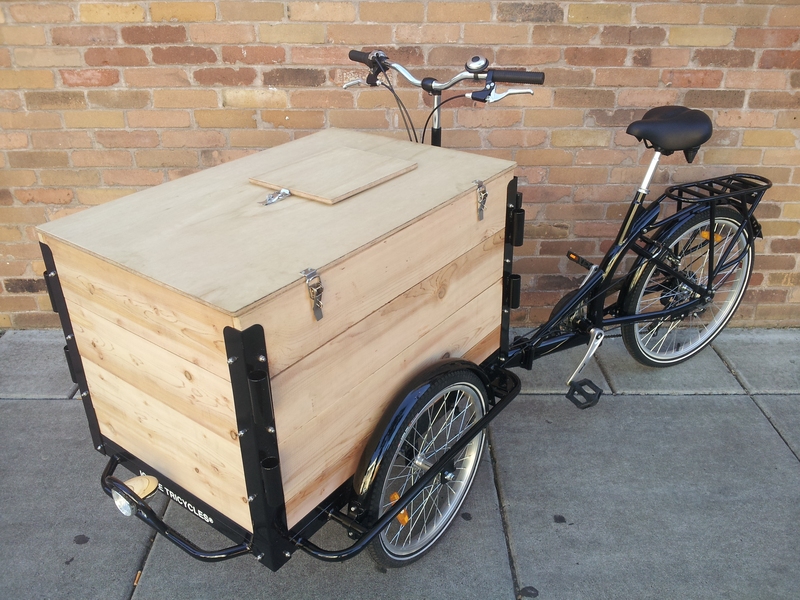 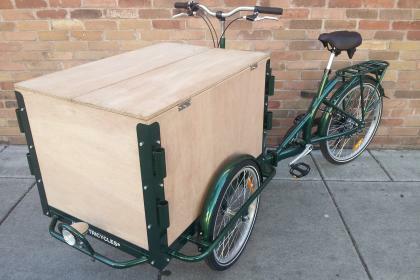 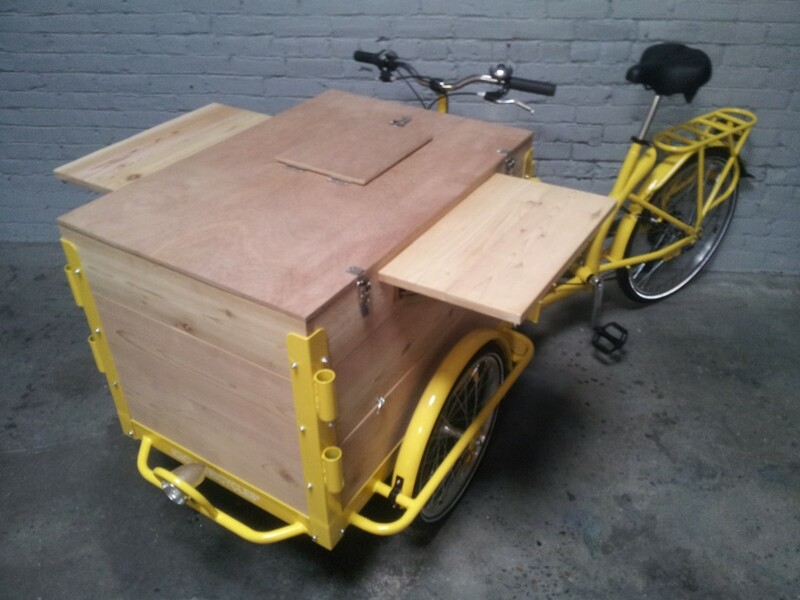 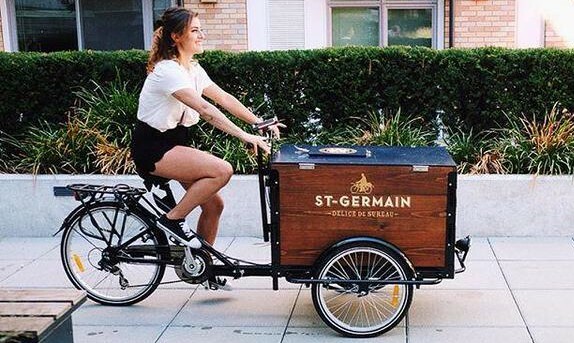 Our wood panel cargo bikes are built specifically to the uniqueness and style of your brand. 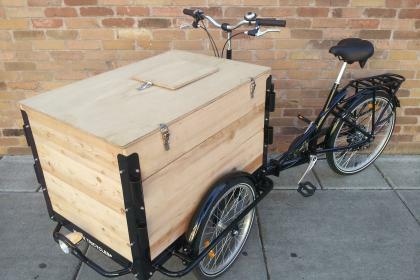 We work with you through every step of the process to get everything just right – hand built and triple checked by a dedicated full service team of passionate woodworkers and cyclists. 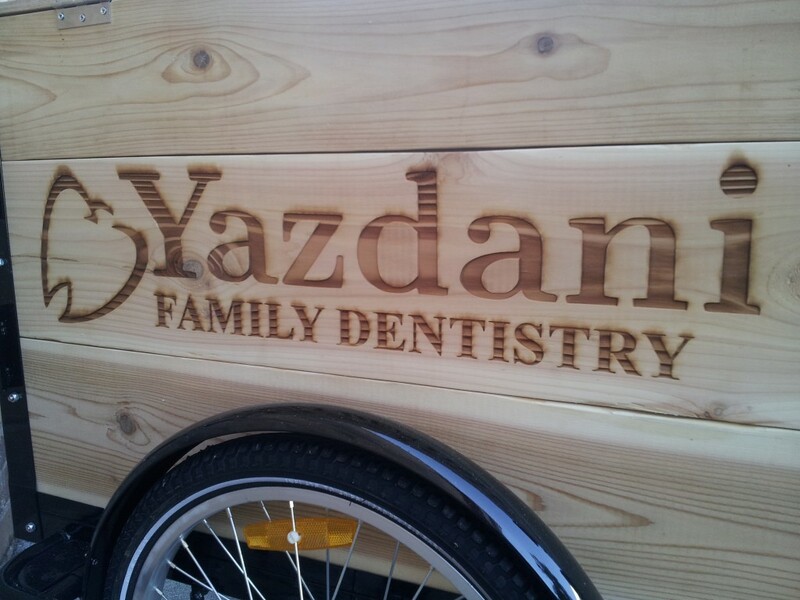 Contact us today to get your new woodwork underway! 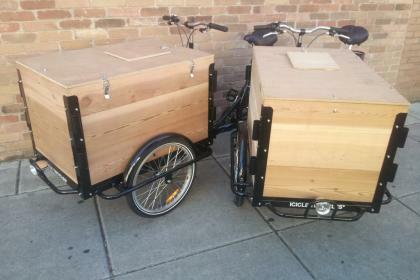 Fan of the look of wood but not the feel? 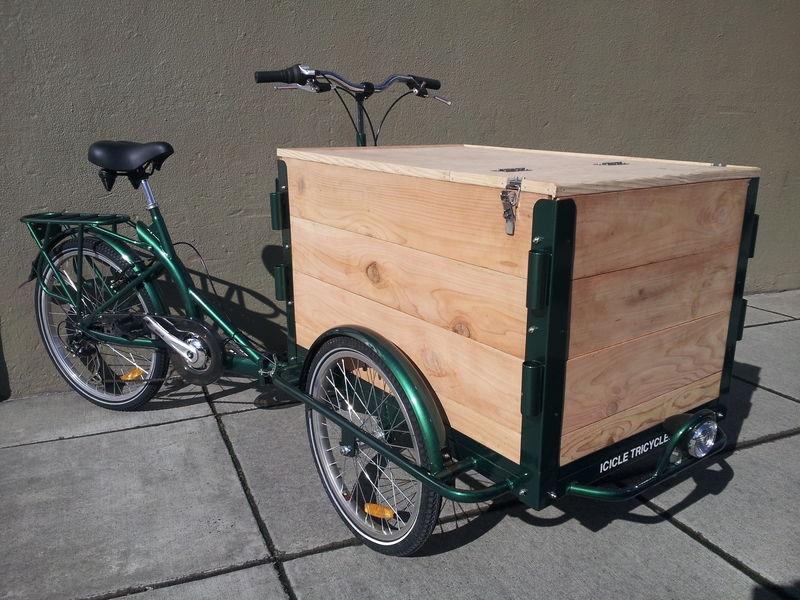 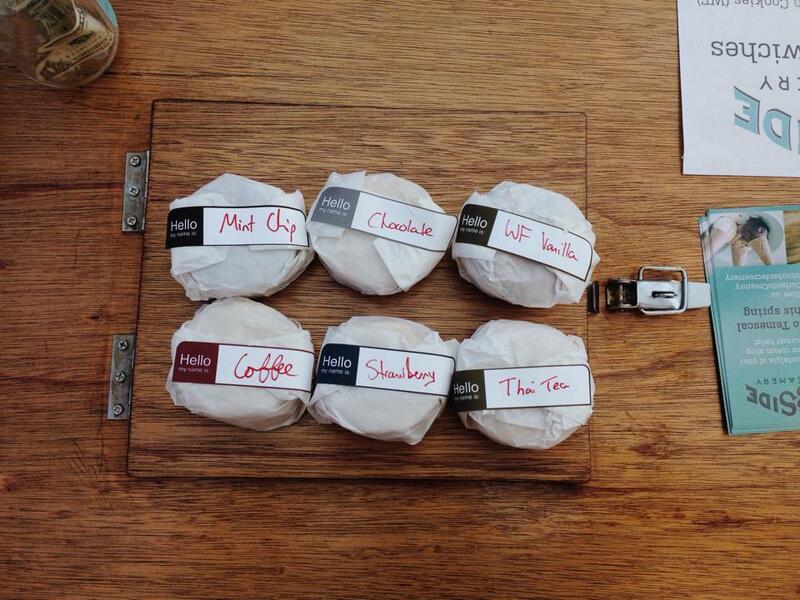 –>Click here to be taken to our wood wrap options!